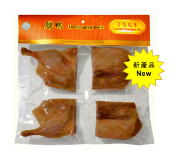 Ingredients: Duck, Sugar, Salt, Monosodium Glutamate, Sodium Nitrite. Refrigerate after open the vacuum package. Cook product to temperature 165ºF before consumption. THIS PRODUCT IS INSPECTED AND PASSED BY DEPARTMENT OF AGRICULTURE.